Europa is already thought to harbour a liquid ocean beneath its icy crust, making the moon one of the main targets in the search for habitable worlds away from Earth. This new finding is the first observational evidence of water vapour being ejected off the moon's surface. 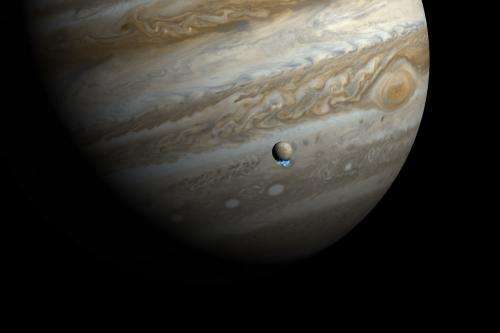 "The discovery that water vapour is ejected near the south pole strengthens Europa's position as the top candidate for potential habitability," said lead author Lorenz Roth of the Southwest Research Institute in San Antonio, Texas. "However, we do not know yet if these plumes are connected to subsurface liquid water or not." The Hubble findings will be published in the 12 December online issue of Science Express, and are being reported today at the meeting of the American Geophysical Union in San Francisco, California, USA. The Hubble discovery makes Europa only the second moon in the Solar System known to have water vapour plumes. In 2005, plumes of water vapour and dust were detected by NASA's Cassini orbiter spewing off the surface of the Saturnian moon Enceladus. The Europa plumes were discovered by Hubble observations in December 2012. The Space Telescope Imaging Spectrograph (STIS) detected faint ultraviolet light from an aurora at the moon's south pole. This aurora is driven by Jupiter's intense magnetic field, which causes particles to reach such high speeds that they can split the water molecules in the plume when they hit them, resulting in oxygen and hydrogen ions which leave their telltale imprint in the colours of the aurora. So far, only water vapour has been detected—unlike the plumes on Enceladus, which also contain ice and dust particles. "We pushed Hubble to its limits to see this very faint emission," said co-lead author and principal investigator of the Hubble observing campaign Joachim Saur of the University of Cologne, Germany. "Only after a particular camera on the Hubble Space Telescope had been repaired on the last servicing mission by the Space Shuttle did we gain the sensitivity to really search for these plumes." Roth suggests long cracks on Europa's surface, known as linea, might be venting water vapour into space. Similar fissures have been photographed near Enceladus's south pole by the Cassini spacecraft. It is unknown how deep inside Europa's crust the source of the water may be. Roth asks, "Do the vents extend down to a subsurface ocean or are the ejecta simply from warmed ice caused by friction stresses near the surface?" Also like Enceladus, the Hubble team found that the intensity of the plumes varies with Europa's orbital position. Active geysers have only been seen when the moon is furthest from Jupiter. But the researchers could not detect any sign of venting when Europa is closer to Jupiter. One explanation is that the long fractures in the ice crust experience more stress as gravitational tidal forces push and pull on the moon and so open vents at larger distances from Jupiter. The vents are narrowed or closed when at closest approach to the gas giant planet. 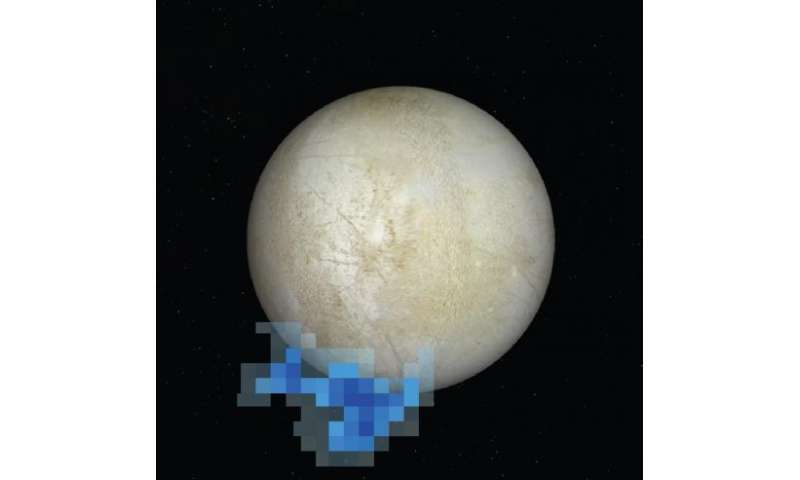 Team member Kurt Retherford, also of the Southwest Research Institute, points out that "the plume variability supports a key prediction that we should see this kind of tidal effect if there is a subsurface ocean on Europa". Future space probe missions to Europa could confirm that the exact locations and sizes of vents and determine whether they connect to liquid subsurface reservoirs. It is important news for missions such as ESA's JUpiter ICy moons Explorer, a mission planned for launch in 2022, and which aims to explore both Jupiter and three of its largest moons: Ganymede, Callisto, and Europa. More evidence of EDM which is misrepresented as water plumes. EDM??? The reporting journalist's weak wording notwithstanding, that plume was not photographed by a camera but by a spectrograph. AFAIK the confusion is not even physically possible with that instrument. Dammit..why are we sending one probe after another to Mars when something like this is beckoning? I realize Mars is probably an easier target than Europa, but we really need to send something there to have a look. And so Jupiter's faint ring system is created. Saturn, Uranus and Neptune likely the same procees. Electronic Dance Music or Event Driven Marketing ? With drills, and a sonar!!! And even better if it's a rover, well it would have to be atomic, but hell, I don't care! Send it !!!! There is synergy between concurrent missions around any given place. Orbiters can cross reference observations between different instruments for callibration, for example, or an orbiter can photograph the location of a rover and its surroundings and act as a communication relay, or predict dust storms. These orbiters and rovers have a limited lifespan though, so it makes sense to get as much work out of them as you can, before you lose them. Besides, there are lessons to be learned from Mars that might apply to other bodies that are smaller and colder than Earth. For example, we now know (thanks to Curiosity) that despite Mars' lack of magnetic field and thin atmosphere, solar radiation isn't too dangerous there. We do need to know these things, and Mars is the easiest place to visit after the moon. Why not do Mars first, then go farther later? Electric discharge machining, you must be new here. Hey, look at that!! If you move the slider on the comment filter a little to the right, you don't have to see any of cantdrive's comments any more. Matter of fact, about half the comments on the page go away. Cool. Oh, and the site doesn't display your ranking history any more, so that should take all the fun out of it for the people with sock puppet accounts, rating whores and 1-bots. I like the changes they made to the site. What a nice improvement. Unfortunately, it still does. You have to click All>> beside recent comments to get to that page and it's still there. Skippy if you had one of those really smart computers like the Ira has you would know that just is not true. Don't blame the tool the tools use.